Think offices have to be a sea of gray or steely blue, ordinary task seating, and nothing stylish about them at all? Think again. Cubiture represents a wide range of some of the best names in office furniture, from the traditional to the not-so-traditional. If your office is in the market for a few new touches or a whole new design, we can help. Traditional doesn’t have to mean old fashioned. Some offices need the polished look of dark woods and leather seating, but with the added benefit of modern conveniences such as discreet ways to hide the cables necessary to operate the technology in a modern office. Traditional furnishings are suitable for an executive space, even if the rest of the office is contemporary or trendy. And if you want to add a contemporary touch, you can always opt for a special element such as frosted glass storage doors. Modern office furniture tends to be more streamlined, sleek, and elegant. And Cubiture has plenty for you to choose from. Maybe you like the appearance of glass accents with easy-care black laminate, or perhaps you prefer a brighter white-on-white look with a touch of wood on the desktop. Think simple, clean, and uncluttered. With no fancy adornments, contemporary is a good fit for a wide range of businesses. From classic cubicles to modern-looking work stations, contemporary office furniture works with almost anything, in offices large and small. Work doesn’t have to be boring, and neither does your office style. 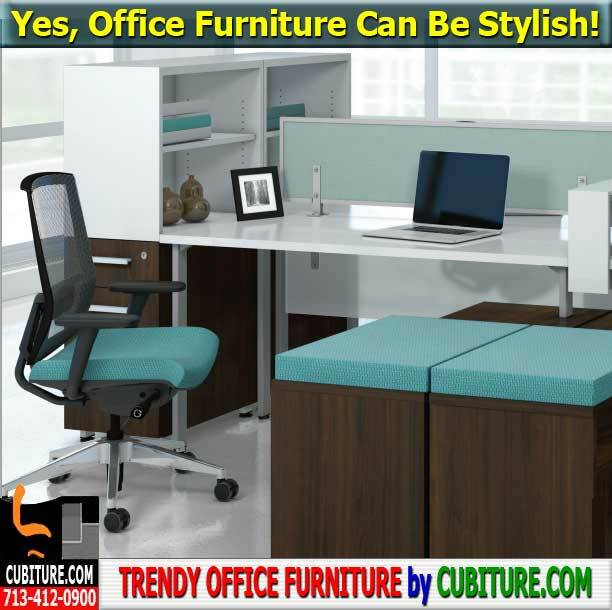 Trendy office furniture lets you incorporate some life and personality into your work space. Creative teams excel in an environment that’s got a little fun, so what about colorful, cafe-height seating and collaborative work tables instead of desks? If you can’t find exactly what you’re looking for, we also offer custom millwork services. As long as you can imagine it, we can create it. Do you have your heart set on electric blue work stations with asymmetrical lines? Or does your business have a signature element that you’d like to include? We can do that. And by adding your ideas to existing designs, you can save money. Modern Office furniture has come a long way from an oversize desk in the executive office and typing tables in the secretarial pool. Now you can have the style you want without sacrificing the functionality that you and your team need. Cubiture offers new designs from major brands such as Bella, Mayline, Hampton, Global Total Office, and many others. And with our design team, you can customize your office almost any way you like to enhance your brand.